EMS offers a series of calibration standards with one and two dimension calibrated patterns. 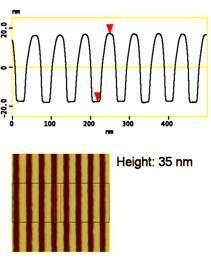 The standards come in two grid spacings – 300 nanometers and 700 nanometers. These standards are created utilizing holographic interference of a particular laser frequency. They are typically accurate to <1% across the entire surface of the standard. 300nm or 700nm nominal (exact dimension will be provided with sample). Measurements are made from leading edge to leading edge, etc. Width of individual bars and spaces is not calibrated. The characteristics of the MXS 702CE standard make them easier to image than the 1-dimensional standards. The 2-dimensional grid facilitates setting the stigmation of the image properly. Once proper focus and sigmation are obtained, the image can be shifted to an appropriate area and the desired measurements made.Since the pattern covers the entire sample area, it is possible to make over 1,000,000 measurements utilizing the standard without using the same area twice. * Silver epoxy is the default adhesive. Easier testing of your SPM. Improved accuracy of critical dimension measurements. Accuracy: 0.5% (1 std. dev.). Holographic fabrication - assures high accuracy and precision. 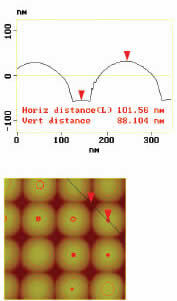 Pattern height > 100nm - provide excellent image contrast. Uniform coverage of entire chip - save time (can image anywhere). Nominal calibrated dimensions: 300 or 700 nm. Calibration certificate: supplied with each sample, stating the dimension to the nearest 1 nm. Pattern types: 1- or 2—Dimensional. 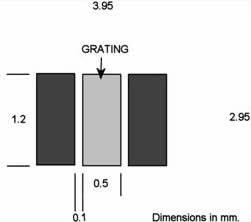 The calibrated dimension is the same for both axes for the 2-D standard. Physical Size: 3 mm x 4 mm x 0.5mm. 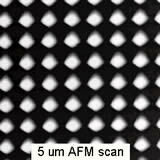 The 1-D standards can be scanned using any AFM mode, including contact mode. The 2-D standards can be scanned using modes such as Tapping Mode™, intermittent contact, and non-contact. Accurate measurements of sub 0.5 micron features are increasingly important as nanotechnology develops and as conventional microfabricated structures (semiconductors, magnetic data storage devices, optical data discs) shrinking. The model 150-1D with a nominal period (pitch) of 150nm, one dimensional, fabricated on a transparent substrate (Aluminum lines on glass) is the new tool to support this work. Each specimen is supplied with a calibration certificate. 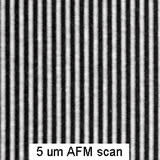 Can be used for AFM, STM and SEM. Has been used successfully in a hot water AFM. Phase Imaging Test Specimen (verify TappingMode™ phase contrast and resolution). Phase Imaging is a sharp probe, which is brought into proximity with the specimen surface. The probe is oscillated vertically near its mechanical resonance fre-quency. 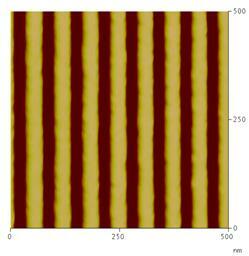 As the probe lightly taps the surface, the amplitude of oscillation is reduced and the AFM uses this change in amplitude in order to track the surface topography. In addition to its amplitude, the probe motion can be characterized by its phase relative to a driving oscillator. The phase signal changes when the probe encounters regions of different composition. Phase shifts are registered as bright and dark regions in phase images, comparable to the way height changes are indicated in height images. 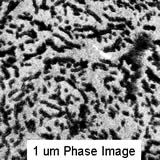 Phase images often show extraordinary contrast for many composite surfaces of technological and scientific interest. These include contamination deposits, discontinuous (i.e. defective) thin films, devices built of composite materials (e.g. magnetic recording heads), and cross-sectional specimens of composite materials. Both inorganic and organic materials can be examined. We have found that phase imaging is more convenient and gentler than other methods, which are based on contact mode operation. It routinely achieves lateral resolution of 10 nm. All mounted on 15 mm steel disk. 1. Pereira, D.E.D. & Claudio-da-Silva, Jr., E. “Improvement of AFM as an analytical Instrument for Residual Lignin Characterization” in: Proceedings International Symposium on Wood and Pulping Chemistry, Helsinki, Finland, June 1995. 2. Pereria, D.E.D, Chernoff, D., Claudio-da-Silva, Jr. E., & Cemuner, B.J., “The use of AFM to investigate the delignification process: Part I –AFM performance by differentiating pulping processes”, to be published. The bump height is about 90 nm. This specimen is not recommended as a height reference because it is not easy for the standard AFM probes to reach the substrate level between the pumps. At 5 kX, the individual bumps were still well resolved. Large fields of view show how few defects are present. The most common defects are single missing bumps or a single extra bump inserted between lattice positions. Two vacancies are present in the image shown above. 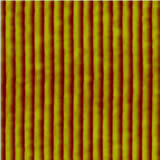 A precision, holographic pattern provides accurate calibration in the horizontal plane for very high resolution, nanometer-scale measurements. 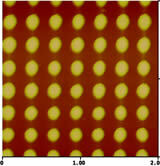 Period:144 nm pitch, two-dimensional array. Accurate to ± 1 nm. Refer to calibration certificate for actual pitch. Surface: Aluminum bumps on Silicon, 4x3 mm die. Bump height (about 90 nm) and width (about 75 nm) are not calibrated. For SEM, an independent analytical lab has tested this specimen in a FE-SEM (field emission scanning electron microscope). They found that the pattern was very uniform and the specimen was easy to image. No significant charging was observed in the voltage range 1-20 kV. Usability: the calibrated pattern covers the entire chip. There is sufficient usable area to make tens of thousands of measurements without reusing any areas altered or contaminated by previous scans. This Calibration Reference specimen comes with a non-traceable, manufacturer’s certificate. These states the average period, based on batch measurements. This traceable, Certified Standard is a select grade. Each standard is individually measured in comparison with a similar specimen calibrated at PTB. (PTB, Physikalisch-Technischen Bundesanstald, is the German counterpart of NIST). The uncertainty of single pitch value is typically ±1,4 nm (95% confidence interval). Multi-pitch measurements provide the usual square-root of N improvement in precision. 2-dimensional array for simultaneous calibration of X and Y axes. Array of pumps mean the image contrast is high even when the probe tip is slightly dull. High contrast in contact mode scans. The pattern covers the entire die so that you don’t have to hunt for the scan area. Available in the following ways: unmounted, 15mm steel disk(for AFM), SEM pin stub, or any other type of SEM stub. 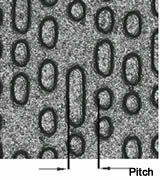 A precision pattern providing accurate calibration in the horizontal plane for very high resolution, nanometer-scale measurements. Period: 70 nm pitch, one-dimensional array. Accurate to +/- 0.25 nm. Refer to calibration certificate for actual pitch. Surface: Silicon Oxide ridges on Silicon, 4x3 mm die. Ridge height (about 35 nm) and width (about 35 nm) are not calibrated. 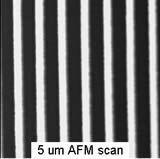 For AFM, use in contact, intermittent contact (TappingMode™) and other modes with image sizes from 100 to 3000 nm. Available unmounted or mounted on steel disks. For SEM, this specimen works well at a wide range of accelerating voltages (1 kV to 20 kV have been tested) and calibrates images from 25 kX to 1000 kX. Normally supplied unmounted. Can be mounted on a stub of your choice. Usability: The calibrated pattern covers a 1.2x0.5 mm area. There is sufficient usable area to make thousands of measurements without reusing any areas altered or contaminated by previous scans. This Calibration Reference specimen comes with a non-traceable, manufacturer’s certificate. This states the average period, based on batch measurements. This specimen is available only mounted on steel disk. This Traceable, Certified Standard is measured in comparison with a standard calibrated at PTB. (PTB, Physikalisch-Technischen Bundesanstalt, is the German counterpart of NIST. The standard is “NIST-Traceable” by virtue of the mutual recognition agreement between NIST and PTB.) The uncertainty of single pitch values is typically +/- 0.5 nm (95% confidence interval). Multi-pitch measurements provide the usual square-root of N improvement in precision. The ridge height is about 35 nm. This specimen is not recommended as a height reference because the standard AFM probes may not always reach the substrate level between the ridges. 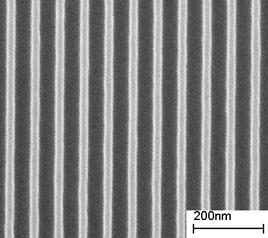 Nevertheless, the image contrast is high, even when the probe tip is slightly dull. You can scan in contact mode, which means you can calibrate and measure faster. The patterned area is easy to find. 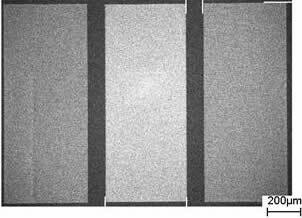 The three rectangles shown in the sketch below are visible in reflected light, with either the unaided eye or an optical microscope. In a low magnification SEM image, the contrast is reversed. 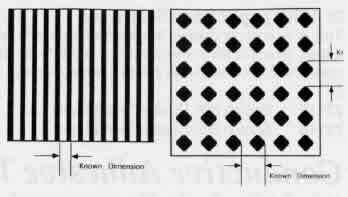 The central rectangle, which is the grating pattern, is relatively bright. 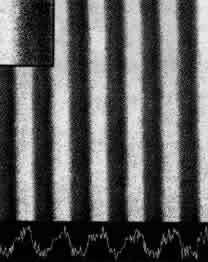 The grating lines are parallel to the long side of the rectangle, as suggested by the high magnification SEM image.